Both will debut very soon, and appear to be more similar than originally thought. Over five years ago, BMW and Toyota made a surprising, though welcomed, announcement: the two automotive giants were to join forces and develop a new rear-wheel-drive sports car platform. Each would sell their version of the car. Unlike the Toyota 86 and Subaru BRZ twins, these new sports cars would not be exact duplicates of one another, but rather distant cousins that shared basic underpinnings. However, new spy shots seemingly indicate the two have more in common than we thought. We’ll get to that. With Geneva just around the corner, it’s possible the Z4 will debut and Toyota has already begun teasing the Supra’s big day. So what do we know about each car so far? For starters, the new Z4 will be sold only as a convertible, whereas the Supra will be coupe only. 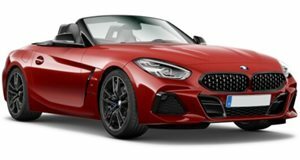 Based on those brand new spy shots, we can clearly see the new Z4 will bear a striking resemblance to last summer’s Z4 Concept shown at Pebble Beach. The trademark twin kidney grille is visible with a mesh pattern in line with today’s latest BMWs. However, the headlight and taillight styling appears to be slightly toned down. Under its hood, we’re expecting two engine options, a 2.0-liter turbo four rated at 248 hp and 258 lb-ft of torque, or, for the M40i variant, a more powerful 3.0-liter turbocharged inline-six topping off at around 380 hp. Expect a ZF-sourced eight-speed automatic transmission to come standard, and it’s possible a six-speed manual will also be on hand, though it’ll likely be offered on the base model only. The Supra, on the other hand, will definitely not offer a manual option. The sole gearbox will be that ZF eight-speed. Now, here’s where things get confusing for the Supra. One report claims the Supra will come powered by that same inline-six, albeit in four different states of tune. Available interior colors will include Glacier Silver, Atacama Yellow, and Crimson Red, all of which pay homage to the late 90s, early 2000s Supra. US–spec Supra interiors will either be covered in fabric, Alcantara, or leather. Wait? What? A fabric interior? 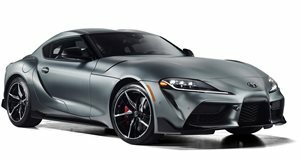 Apparently so, and that’s because the base Supra will be positioned even lower on the pricing spectrum than the base Z4. In fact, it’s said to have manual seat adjustments and no navigation system. We were not expecting to hear that, nor the “name and body design only” news. A few months ago, there were indicators the Supra would have its own unique characteristics, from interior and exterior design to how it drives. There were even some rumors of a hybrid powertrain. But that was then. If you compare the fresh batch of Z4 and Supra spy shots, you’ll clearly see a remarkable resemblance, dimensions wise. In fact, save for the front and rear end styling, and hard or soft top, you’re looking at nearly the same vehicle. Even the side mirrors look identical. Fortunately, the Supra looks like it’ll have a front headlight design similar to the previous Supra’s look, for those who appreciate nostalgia. indicates we’ll first see it as a concept called the Supra GRMN Racing Concept, complete with a massive rear wing. Could the Supra also be heading towards a racing career? Maybe. We’d be cool with that. The Z4, however, because it’s a roadster only, will likely keep to public roads only. So there you have it. That’s everything relevant we know about both the new BMW Z4 and Toyota Supra. If these latest reports prove to be correct, then both will be more than just distant cousins, but rather first cousins with different faces. They still share the exact same genetic code.